A great kids' guessing game that sneaks in a little math practice without them knowing it! 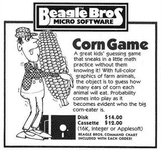 With full color graphics of farm animals, the object is to guess how many ears of corn each animal will eat. Probability comes into play as it becomes evident who the big corn eater is.